Whitley Bay returned to winning ways with a victory over Washington that was more convincing than the 2-1 scoreline would suggest. Two goals inside the first ten minutes proved sufficient to overcome lowly Washington, who in a rare attack, pulled a goal back midway through the second half. With just four minutes played, Whitley were awarded a penalty when Adam Shanks was bundled to the ground by former Bay striker Ash Davis. Vociferous complaints from the visitors proved fruitless and when calm was restored, Callum Patton sent keeper Dale Connor the wrong way with a perfectly executed spot kick. A good start quickly got even better when in the ninth minute Patton played an excellent ball through to Kyle Fryatt who took it round Davis before slotting neatly under Connor from 16 yards. 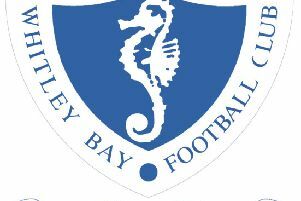 Comfortably in control, Bay were frustrated by some robust challenges that went unpunished until midway through the half when Galpin was cautioned for persistent infringements. Davis, a striker in his Whitley days, was playing in defence for the Mechanics, but a surging run after 27 minutes saw him produce a 20-yard shot that gave Bay keeper Tom Flynn his only save of the half. Defender Josh Nearney, whose loan period from Hartlepool United has just been extended, then limped off injured, to be replaced by Callum Munro. Back on the attack for Whitley, Fryatt supplied Shanks with a chance that flew narrowly wide, but moments later they were denied a third goal in controversial circumstances. Andy Robertson fired a low shot beyond Connor from out on the right and the ball crossed the line before hitting the diagonal bar on the inside of the goal frame and rebounding back into play across the goal. Having not spotted the incident, the match officials allowed play to continue but only 60 seconds later, Fryatt nearly made it 3-0 but his shot that was kept out by Connor. A goalbound free kick from Shanks was then headed behind as Washington rode their luck in the closing stages of the half. Nine minutes into the second period, Waters produced a rare attempt on goal for the visitors but his shot was well off target. Shanks then threaded the ball through the Washington defence to Fryatt who looked well placed but delayed his shot and the chance was gone. It was nearly all Whitley at this stage and after Shanks had fired too high, Wilkinson was denied at point blank range when Connor made a fine save with his feet after Robertson’s initial effort had been blocked. When Shanks was unceremoniously brought down 25 yards from goal, Andrew Brown was the latest Washington player to be cautioned, before being quickly substituted. Having failed to pose any real threat in attack all game, Washington reduced the arrears with a goal out of nothing when Flynn raced out to claim a high ball but misjudged its flight and was beaten to it by Marc Costello who sent a looping header over the stranded keeper and into the unguarded net. Whitley might have restored their two-goal lead within three minutes but Alex Kempster’s fierce angled shot was pushed over the bar. From the resulting corner, Robertson headed just over the bar. Robertson then had a shot blocked with Kempster drilling another effort into the side netting. The chances kept coming as Whitley poured forward and Robertson had the ball in the net after being set up by Kempster only to see the goal ruled out by an offside decision. Kempster was getting past the Washington defenders with increasing regularity and five minutes from time, his ball from the right flew across the face of goal only to be finger-tipped clear by Connor just as substitute Callum Anderson was about to apply the finishing touch. The visitors tried to push forward towards the end but without posing a serious threat, and their physical approach resulted in another caution after Anderson was tugged to the ground by Brassell. Their indiscipline continued after the final whistle when Lewis Galpin was shown a red card by referee Chris Ellis as the players returned to the dressing rooms. For Whitley it was a well deserved victory and the margin could have been considerably greater if they had capitalised on the chances they created. That was something manager Ian Chandler highlighted after the game. He said: “It could have been six or seven. It was a good start with those two goals and then there was the goal that wasn’t. I think most people thought it had crossed the line. “In the second half we had four or five situations where we could and should have scored. Whitley Bay: Flynn, Nearney (Munro 28), McDonald, Allen, Wilkinson, Patton, Fryatt (Keltie 76), Fowler, Robertson, Shanks (Anderson 76), Kempster. On Saturday Whitley Bay travel to the North Yorkshire coast to play Marske United just four weeks after the sides drew 2-2 at Hillheads. Then on Tuesday, October 18, Whitley are at home to another North Yorkshire side, Guisborough Town, with a later than usual kick-off at 7.45pm.